Water and wastewater treatment on the African continent plays a vital role in various areas of compliance and good practice. One of the greatest challenges in implementing proper wastewater treatment and management in some municipalities (and for businesses such as mines) is the remoteness of their locations. That is why WEC Projects has devoted more than a decade to providing a truly advantageous solution for precisely these settings: packaged wastewater solutions. The first obstacle presented by remote locations is the time, effort and cost involved in transporting materials and teams to the proposed site. 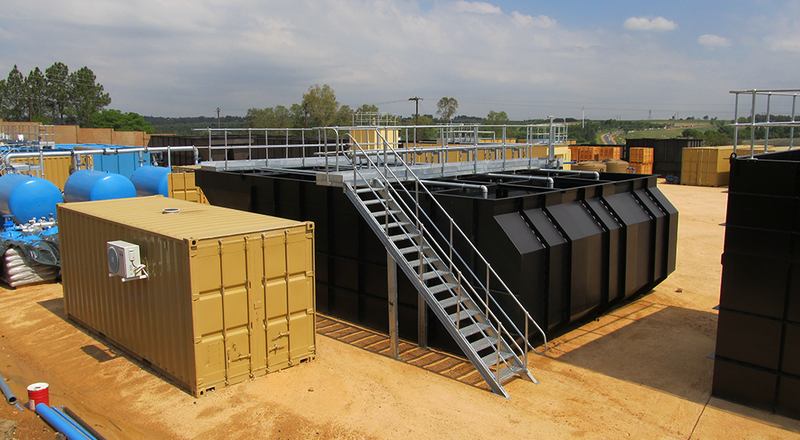 Our process and design capabilities and experience have enabled us to dramatically reduce these costs by adapting the necessary water and/or wastewater treatment technology into packaged, containerised solutions. These packaged water treatment plants can then be easily transported to the site, unloaded directly at the designated position, and immediately installed and commissioned. Therefore, in terms of transportation and installation, the advantage for the client is that this solution provides greatly reduced lead time, build time and installation time. Consequently, this also offers an opportunity to save a great deal on costs associated with these factors. Another advantage of our packaged water treatment plants lies in the adaptability of their modular design. The simplest form of this advantage is the ability to adapt the system in accordance with any changes in the area by bringing in and installing additional modules. Furthermore, should a drastic change occur which requires the plants to be moved to another area, they can be repackaged, transported to the new location and reinstalled where they are required. Adding to the adaptability feature noted above is the fact that our packaged water treatment plants can be quickly and easily fabricated. This ensures that when extra modules are needed for adaptations they can be fabricated in the shortest possible lead time and transported to the site without delay. Despite the quick and easy fabrication of our designs they are kept to a robust and heavy duty standard. This way we ensure that all of our packaged water treatment plants are built to last, as well as being strictly compliant with all relevant legislations. More than the advantages offered by our industry leading designs and equipment is the excellence of our team. Contact us to get the best of our experience and expertise in water and wastewater management.